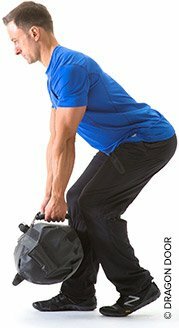 Fill In Training Gaps With A Sandbag! Introduce more instability into your training, and your whole-body strength and athleticism will go through the roof. Make your squats, lunges, cleans and presses do more by doing them with a sandbag! In 2004, I was inspired by a book called "Dinosaur Training: Lost Secrets of Strength and Development." I had been a strength coach and Bodybuilding.com author for years, and I had a passion for highly difficult, unconventional movements—like one-arm barbell lifts, for example. But this was the first time that I had seen such extensive writing on the concept of "odd object training," a training style that old-time strongmen knew well. Author Brooks Kubik described athletes who had the movement skills of a trained gymnast, but also the strength of a top-level lifter, a combination we rarely see in today's fitness landscape. Why would such athletes use irregular, hard-to-control objects like heavy bags, anvils, kegs, and barrels? They all had different reasons, but most came back to the idea of "filling in the holes" in most strength training programs. These great athletes believed that odd objects hit the body, and developed it, in ways that standard weights could not match. What stuck with me most, though, was a section on sandbag training. Kubik insisted sandbag training was unlike any other form of training, including other odd objects, both in the demands it placed on the body and the results it produced. "It builds a type of rugged, total-body strength that is impossible to duplicate with other equipment," he wrote. How could you not be intrigued by a description like that? Full of enthusiasm, I did what many of you probably have done in a similar situation: get that army duffel bag out, fill it with garbage bags full of sand, and duct tape it all together. This simple recipe for a homemade sandbag made me ready to train and bask in the great results. After all, Kubik himself wasn't working with anything fancier than that, right? Guess what? It worked—well, for a little bit. It was different and hard, and I created a set of homemade sandbags of different weights. Then their effectiveness waned. I was left to think something that so many have struggled with: Sandbag training just doesn't work all that well! Ten years later, I can conclusively say that the problem wasn't the sandbag—it was me. I spent the last decade studying and perfecting sandbag training, with the goal of doing what nobody else seemed to be able to do until now: use the sandbag as the foundation of a complete strength training program, which I call the DVRT system. "You don't have to have a PhD in biomechanics to see that sandbags look and function differently from any type of iron-based weights." Initially, the big mistake I made was trying to program and use the sandbag like a barbell. You don't have to have a PhD in biomechanics to see that sandbags look and function differently from any type of iron-based weights. This causes people to assume, wrongly, that sandbags can't make you strong. The truth is that they simply need to be programmed differently for you to see their benefits. As we get better at using stable implements like barbells, dumbbells, and even kettlebells, the way these weights move becomes predictable, and our bodies become great at "grooving" them, or moving them in the most efficient way possible. Sandbags, however, are inherently inefficient. Every repetition is just a little bit different than the one that preceded it. And less efficient movements strengthen the body because they force all muscles to work together. I've seen firsthand that when the small muscles start working in synergy with the big muscles, the result is a much stronger and injury-resistant lifter, as well as incredible boosts in fat-loss, endurance, and overall athleticism. Sounds great, right? Well, in the short-term, all of this simply means that sandbags make your body work harder than any other implement. 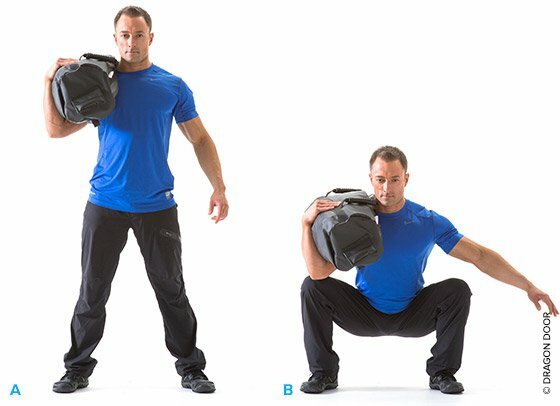 For instance, in a forthcoming study from the University of Wisconsin-Milwaukee, researchers compared the Ultimate Sandbag I created to dumbbells in a lunge exercise. The subjects held both implements in the rack position, the same load was used, and the same number of repetitions was performed. The outcome? The Ultimate Sandbag group had on average eight beats per minute higher heart rate than the dumbbell group! That was no surprise to me, of course. The lesson is that there's something entirely different going on in sandbag training than in other modalities. Try it, and it might change the way you see fitness. Unlike, say, kettlebells and suspension systems, you don't need to learn a whole new catalog of movements to embark on sandbag training. Squats, cleans, presses, rows, and lunges are the staples of much of what we do. What changes with sandbags is how you progress once a movement gets too comfortable. In my book DVRT: The Ultimate Sandbag Training System, I identify nine variables that can be changed to make a movement less efficient and more difficult. How we hold a weight is rarely ever programmed in a fitness program. We may use different holding positions just to give ourselves variety, but we rarely think of it as a means of offering progression. A big reason is that most implements don't allow a lot of options in this regard. If we look at squatting for an example, we have three major variations we can use for a barbell: back, front, and overhead. There are also three for a dumbbell or kettlebell: goblet, rack, and overhead. We have nine when it comes to the sandbag. These don't just represent nine ways to hold the weight, but also nine specific ways to make the squat better for distinct training goals. Some make the weight become more stable, others less. A bear hug squat is an example of a more stable squat, while the shoulder squat is a more unstable squatting pattern. 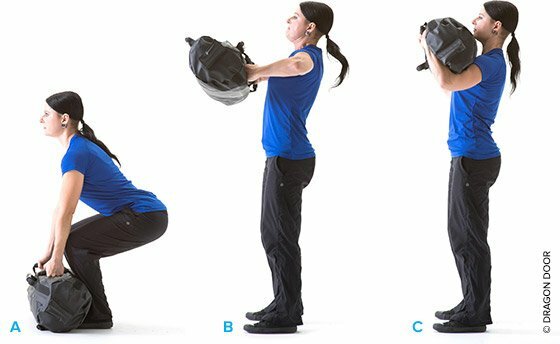 Just like holding position, the way we position our bodies when we lift the sandbag can make the weight feel more or less stable. For an example, let's look at the power clean. With a barbell, most lifters would never dream of ever performing this with anything but a standard bilateral stance. And you can definitely perform it that way with a sandbag, too. So what comes next? If you stand in a staggered stance, with one foot slightly ahead of the other, the same load now feels more unstable—and more like the sort of lifting stance we use in most real-world and sport scenarios. You can also change planes of motion moving laterally, forward-stepping, or even rotationally to clean the sandbag and change its stability. Why does a 100-pound power clean with a sandbag feel equivalent to a much heavier barbell? People will say, "Because the sandbag is unstable." But in actuality, the sandbag is moving through a vertical plane in line with the body, just like any other weight. The real difference is in dimension and leverage. People forget that as sandbags get heavier they also get larger. No other implement has such a dramatic change in its size as a sandbag as the weight changes. Heck, kettlebells and barbells even go a long way to stabilize the size with competition kettlebells and bumper plates. Where these implements want to have a more predictable movement, we want anything but! The sheer size of a sandbag can make just lifting it much more grueling, nearly as much as the weight inside. What do I mean? If you lift two sandbags of the same weight but different dimensions, they'll feel different. 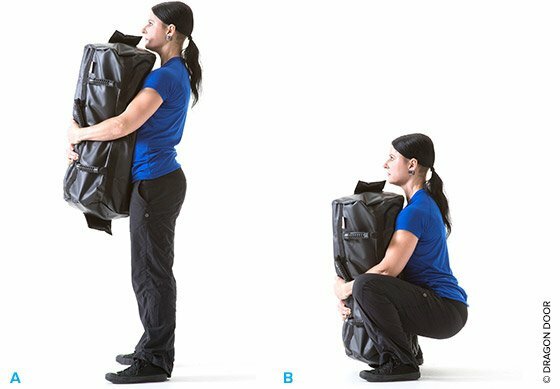 Keeping the same weight, but moving to a larger sandbag, completely alters the feel and outcome of an exercise. Sometimes it will help make an exercise more stable, like in the bear hug squat, or it can make it far more challenging, like in the clean and press. The only downside to having so many ways to progress in sandbag training is that people often rush to change. Your first goal should be to cement good movement patterns and get accustomed to the unique challenges a sandbag provides. Only once you have mastered these movements should you begin to add complexity. Then you can start creating programs, progressions, and dialing in which exercise is best for your precise training goal. Perform all exercises consecutively as a circuit. On the first series allow 20 seconds of rest between exercises, 30 seconds in the second set, and 40 seconds on the third set.